I had a week off during the school holidays back in July and a little bit of birthday money to play with so I went on a little adventure for some sunshine, soul searching and to do what I came to Australia to do: Live loving and love living. In other words – live in the moment and smile. 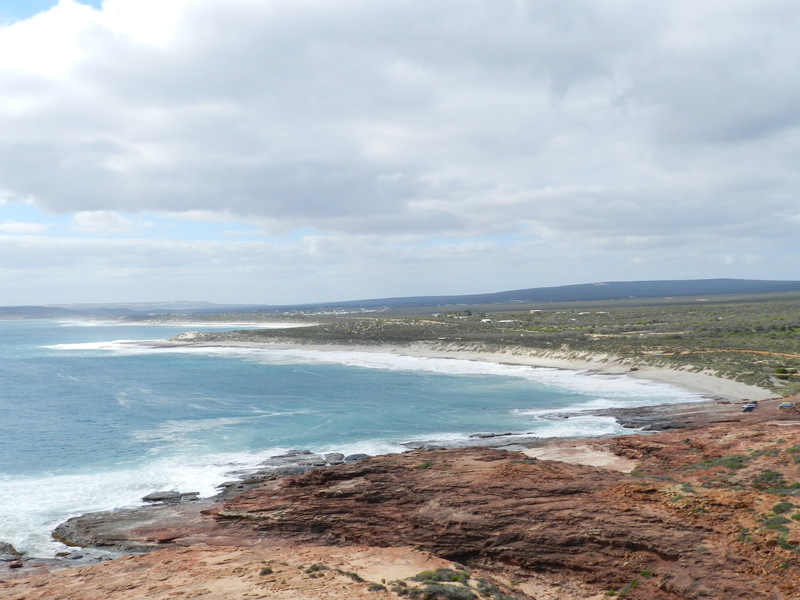 My destination was Kalbarri – a small township on the coast about 7.5 hours north of Perth. Having searched fruitlessly for a cheap way up the coast: looking for ride-shares and even couchsurfing options, I went back to what I know best – long distance buses and youth hostels. Throwing some caution to the wind I booked a one-way bus trip from Perth to Kalbarri and one night in the only hostel there hoping the rest would fall into place, which – as is nearly always the case – it did. But there is no such trip that Grace can make without a bit of sweat and stress (read up on my Slovakia stories for more of this) and a little bit of sweat and stress was what I had the morning of my departure.There have been a number of times when my last minute nature is entirely responsible for any mishaps I may have had, but having learnt from that I find that sometimes in my world – things are simply just not simple! Getting from where I live in Carine (a northern suburb of Perth) to the bus station in East Perth would normally have been a fairly easy transition of a bus from my house to the train station, a train to the city, a train to East Perth and then a short walk to the bus station. However, the good people of Transperth wish to improve their frankly-not-very-convenient public transport system and chose to do this by shutting the central stations and disrupting normal service during the school holidays. Leaving my house at 06:40am for an 08:30am bus should have been ample time and would generously have allowed time for breakfast and coffee at the station cafe before my 8 hour bus trip. Not for me. Of course. My weekend bag and handbag pissed me off on the lengthy transits I had to do on three occasions. The length of the footbridge overpass at Leederville, platform at McIver station and overpass at East Perth were far too long for heavy bags. I was quietly impressed with how well organised and smoothly the transition to replacement transport went at Leederville, as well as surprised by the number of staff they apparently needed to orchestrate it all. These staff members would have been much more useful on the next leg of my journey as the location of the free transit bus had changed and information of its whereabouts or timetable were non-existent. About 50 of us grunted and squeezed into it as it arrived after 20 minutes (not 8 as promised) and trundled 600 metres to the next train station – much to the bewilderment of many of the passengers who dismounted. Since everyone seemed to be going to or coming to McIver station, the 1.5m path of its entrance became almost impassable with the surge of commuters. Trains were then waiting at platforms they weren’t normally on and I burst onto the train moments before its door beeped shut – with looks of sympathy from my carriage mates. “This is bloody ridiculous!” I panted to which the “friendly” commuters either nodded or busied themselves looking at what was in their hands or on the wall of the train. I am pretty sure in the UK this is the rare occasion when people DO converse and unite on the opportunity to have a good old moan. On arriving at East Perth my shoulders ached once I saw the length of the passenger bridge and I almost walked in the wrong direction once of it by mistaking a coach for the not-very-obvious coach station. On arrival, although desperate for a coffee, as it was 08:17 I immediately checked in and then ran to the cafe only to realise I couldn’t get anything for less than $10 paying by card, nor could I withdraw cash without forfeiting the $2 charge. And when every cent of your trip counts – coffee has to wait. Posted on August 2, 2013, in Australian Adventure and tagged Australia, bus station, commuters, East Perth, hostel, Kalbarri, Leederville, McIver Station, passengers, Perth, photography, public transport, smile, train, transit, travel, Western Australia. Bookmark the permalink. Leave a comment.